One of the issues in the debt ceiling debate is the size of the increase in borrowing capacity, which effectively determines how long before the government runs out of money again. President Obama and some Congressional leaders have demanded any debt ceiling increase cover the projected federal deficit for at least 18 months, thereby deferring the next debt ceiling vote until after the November 2012 election. Congress has passed and the President has signed three debt ceiling measures over the past 2 ½ years. Here is the history of the debt ceiling votes since President Obama took office in January 2009. President Obama’s current insistence for a limit to last 18 months is longer than any of the three extension bills he previously signed. Given the acrimonious nature of the current debate and political wrangling, it’s understandable why he prefers to push any future debate beyond the 2012 election. However, a political preference to avoid a contentious issue does not justify vetoing legislation with a shorter time frame. Many Republicans are willing to pass a shorter-term measure because they believe the political sentiment on this issue is in their favor. In all fairness, if they believed a short-term measure was detrimental to their political future, they would be pushing for a longer term solution as well. The supporters of the 18-month measure have argued a short-term increase will continue to negatively impact the economy and jeopardize the U.S. Government’s credit rating. However, neither Moody’s nor Standard & Poor’s have indicated the size of debt increase as a significant factor in assessing the credit rating of U.S. Treasury securities. Both have stated there are two primary factors they are considering; 1) the U.S. not defaulting on any of its payments and 2) a meaningful reduction in future budget deficits. 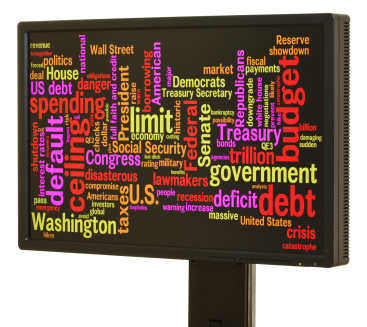 The length of a new debt ceiling has not been mentioned as having any bearing on their assessment. The markets seem to echo this sentiment. We’re days away from the August 2nd default date, yet there has been no appreciable change in the trading or pricing of U.S. Treasuries. It appears traders and investors assume Congress will pass some measure to prevent the government from defaulting, even if it’s short term. Although investors prefer Congress to act sooner, they understand the political landscape and realize such issues often result in deals being cut at the last moment, or Congress passes a short-term extension to grant themselves more time to reach a deal. The 2011 Budget is a good example. Rather than shutting down the government for failing to reach an agreement, Congress passed six continuing resolutions to fund the government from October 1, 2010 through April 8, 2011, before the final budget deal was reached. The shortest continuing resolution was 3 days, keeping the government operating from December 18 – 21, 2010. Although it may be annoying and unnecessary, short-term extensions to keep the government operating have become rather common. At this point, I think a short-term resolution is probably the most likely bill to pass. As much as the President may want an 18-month limit and some conservatives want no increase in the debt ceiling, neither one of them wants to be the blame for the U.S. government defaulting and the potential economic chaos which could result. Political winds can shift rather quickly, and no one wants to be caught downwind of decision which freezes the markets or dramatically increases interest rates. If you have read any of my prior articles, you know I strongly believe dramatic long-term changes to our fiscal policies are necessary. At the same time, significant changes in policies or spending should not be hastily passed, and I would much prefer good legislation over expediency. Everyone may be tired of the debate and just want it to be over, but don’t allow politicians to obscure what they’re doing by waiting until the last minute to present and pass something. Spending cuts and tax increases affect real people. Tough choices need to be made… that’s a given. Let’s just make sure we all have time to understand the choices being made by our elected officials; before they are enacted.